Ron Fuller retweeted from the corporate Cisco Nexus 7000 account a new report released by the Cisco Nexus Validation Testing (NVT) program. NVT is a new testing methodology from Cisco, where a new NX-OS version is not released to market until it successfully completes testing in a customer-like network topology. The idea is to test NX-OS by running it just like a customer would – a typical deployment scenario. We talked about NVT with Ron at some length in Packet Pushers Show 152; head over there for more information on NVT. What’s in this new NVT report? I’ll quote the introductory paragraph. 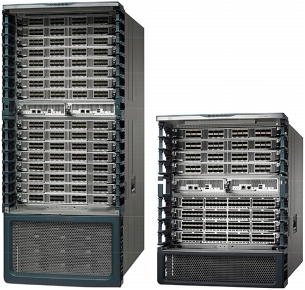 Cisco Nexus line of Data-center product hardware and software releases must pass Cisco’s comprehensive quality assurance process, which includes a multistage approach comprising extensive unit test, feature test, and system-level test. Each successive stage in the process adds increasingly higher levels of complexity in a multidimensional mix of features and topology. Nexus Validation Test (NVT) has been established as an additional quality assurance stage in order to leverage customer feedback and requirements into the product development cycle. NVT will validate and publish guidelines for deploying NX-OS switching and UCS solutions for datacenter networks. This document describes the NVT topologies, hardware & software configurations, test procedures and findings. Addendums to this document will be published when NVT completes any future test cycles using the same test topology and procedures. If you’re remembering the nasty reports from the SafeHarbor program that were tedious piles of pages of test results with little that seemed…helpful, I see NVT as something different. The report is long, but digestible at roughly 125 pages. The description of the tests are in human-readable English. The testing topologies are clearly diagrammed and labeled. For example, here’s one topology diagram I chose at random, which you can click to biggify. The document has several more like this. The report also has useful descriptions with context (!) of features employed in the NVT testing paradigm. In other words, you get not just what the test was, but why you should care. Here’s an excerpt. 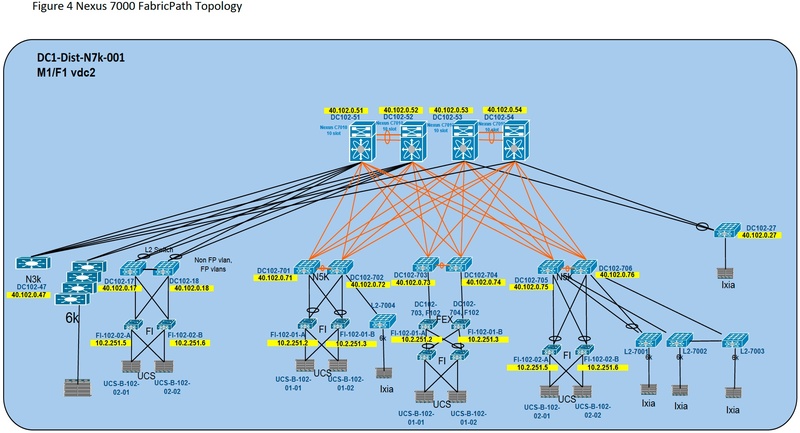 Cisco provides multilevel high-availability architecture for OSPF: Non Stop Routing (NSR) and Graceful Restart (GR) with NSF. With NSR, OSPF preserves the running state of the protocol data and sessions in persistent memory. If the OSPF application fails or needs to be restarted for any reason, it will restart from the preserved state to ensure that there’s no disruption seen by any of its OSPF peers. The internal applications that manage the routing table and hardware forwarding tables will also not experience any failure, allowing for non-disruptive OSPF process restarts. If you’re building data centers that rely heavily on Nexus kit, this is a report worth reading. Go get it.